Teachers, sustainability coordinators, parent coordinators and garden champions: it’s your lucky day! 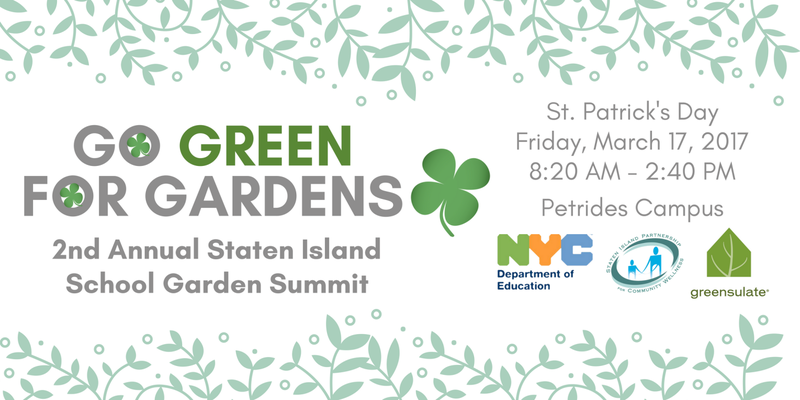 The Staten Island Partnership for Community Wellness (SIPCW) and the New York City Department of Education (NYC DOE) invite you to the 2nd Annual Staten Island Garden Summit on St. Patrick’s Day—Friday, March 17, 2017. This interactive Professional Learning Opportunity will give you the tools to start, expand or sustain your school’s garden. In addition to the useful information and hands-on training, you’ll also receive plants, seeds, raffle opportunities and other great giveaways. A light lunch will be graciously provided by The Michael J. Petrides School. Concerned about leaving your school short staffed? Don’t worry – D31 funding for substitute teachers is available. RSVP today for this fun, informative event, by visiting our EventBrite invitation.